By streamlining the conventional dent repair process, Overdrive Auto can bring your car back to its original condition quickly and more affordable than a traditional auto body shop. Our automotive paints blend seamlessly with your car’s original color. Plus, you get a life time guarantee ‘“ Overdrive Auto. There’s nothing worse than a pockmarked car. 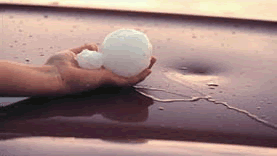 Even small hailstones can cause countless dents and dings, leaving your vehicle looking like the surface of the moon Overdrive Auto paintless dent removal service can make it look as smooth as glass. The benefit of paintless dent removal is that it doesn’t require sanding, painting or replacement. Instead, our skilled specialists use the latest techniques and equipment to gently massage the dents away and return the car’s exterior to its original beauty. Repairing minor hail damage is usually a quick process ‘“ and it’s much more affordable than painting and/or replacing the dented panel.